Okay, first of all I LOVED that the couple wasn't a pair of twenty-somethings, no offense to them. I just like to read about people my age once in a while. The heroine Brie is 29, almost 30, while the hero Cyrus is in his 50s. So that was a plus right there. 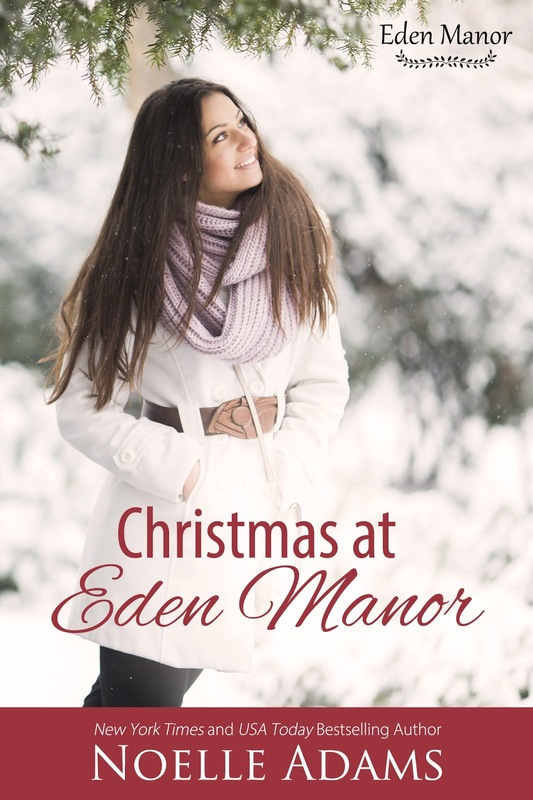 Although "Christmas at Eden Manor" is apparently the conclusion of several different stories and has references to preceding stories, the book works as a stand alone. Cyrus is a hard working man who has made lots of mistakes n his time and feels he doesn't deserve happiness. He's on vacation when he meets Brie, who is between jobs, between boyfriends, and between homes (she's living with her brother and his wife). There's an immediate connection and they begin an affair, one they agree at the start will be of limited duration. But hearts and emotions don't listen to our brains or to logic and they find themselves falling in love. Cyrus throws up road blocks, convinced that if she really knew him, she wouldn't want him. "Christmas at Eden Manor" (if you're looking for a Christmas story, that's only the later part of the story as is the manor) was sweet, romantic, and full of hope and joy. Cyrus and Brie are good for each other and to each other. I really liked Cyrus's employee Gordon; he was perceptive, persistent, romantic, and sweet. Maybe he'll get a story of his own. Although "Christmas" was sometimes too sweet and sugary and I didn't quite get why Cyrus felt so undeserving of love, I enjoyed the story. If you want a feel-good story, this is the book for you. A surge of curiosity banished a lot of her decadent languor. “How long?” she demanded. His eyes transformed as he gazed at her. The shift was almost imperceptible, but Brie felt a shudder shape itself in the base of her spine in response to his expression. “Do you always get what you want?” Cyrus continued, his voice throaty, the texture making her shudder even more. It took her a minute to unravel this comment, but when she did she was moved even more. The man didn’t even seem to be trying, but he had the knack for always saying the right thing, for being kind and romantic and civilized, all at exactly the same time. She’d never believed it was possible before. She knew she was treading in dangerous waters here. She was on the verge of being swept away by him completely. She wanted to enjoy herself with him this week, but she didn’t want to do something so foolish it would leave her hurt and lonely next week. She didn’t know this man. Not really. So she could feel a resistance rising inside her, at the same time as the deep attraction. She needed to change the mood between them. Quickly. He stood up and took her hand to help her out of her seat. Then he didn’t let her hand go as they strolled through the gardens again. She soon realized her suggestion might have been a mistake. The rich scent of the air, the soft moonlight, and the feel of Cyrus’s warm hand quickly went to her head. She felt unsteady, overly warm, and so fluttery she couldn’t take a deep breath. “God, Cyrus!” she gasped, as an ache of need pulsed through her before she was ready to handle it. Cyrus had appeared calm, leisurely, at his ease. But he’d evidently been fighting feelings of his own. Her breathless cry seemed to snap his control. He used his clasp on her hand to pivot her around and then slid his free arm around her, pressing her against the length of his body. His warm, lean strength was exactly what Brie wanted to feel. She freed her hand from his and instinctively twined her arms around his neck. With his hand now free, he used it to cup the back of her head. “You’re so beautiful, Brie,” he murmured thickly. “So beautiful and… and glowing with life.” His eyes like flames, almost fierce in the moonlight, he leaned his head down to claim her lips. 1 grand prize winner will receive a $25 Amazon Gift Card! 1 runner-up will receive an eBook bundle of "Seducing The Enemy" and "Hired Bride" by Noelle Adams! Sounds good. I am definitely going to try to do more holiday reads this year! Are you participating in the Ho Ho Ho Read-A-Thon next month? It's all about holiday reads.